Water bills are issued quarterly. They are mailed on or about the first day of February, May, August, and November. If your water bill is abnormally high, you should contact the village office immediately. If the bill is high due to an undiscovered leak in your water line, the Board of Trustees may be able to grant an adjustment. However, you must fill out and submit an application for Board review before the end of the next billing period. The applications are available at the Village Clerk's office. Payment of your water bill is due within 30 days of receipt of the bill. Unpaid water bills are subject to a penalty of 10%, and, if left unpaid, are re-levied on your property tax bill. Sewer Rent Charges will be on your Water Bill. The sewer rent charges are to cover the operation and maintenance costs of the sewer system and are based on water usage. They are mailed on or about the first day of February, May, August, and November. The minimum quarterly bill for all buildings, structures, and apartments connected to the sewer system and also serviced by a Village water meter shall be established by the Board of Trustees at a specified rate per quarter, which rate shall be $40 for the first 1,000 cubic feet of water consumed and $3.25 for each 100 cubic feet thereafter. All quarterly sewer use charges shall be due and payable at the same time water bills are due and payable. In the event that payment is not made by the due date, then 10% shall be added to the said sewer rent, and if left unpaid, will be re-levied on your property tax bill. A second cost component of the sewer system is the repayment of the debt incurred to build the system. This cost is assessed as a separate line on your property tax bill which you will receive in June, and is called the "Sewer Benefit Assessment". This fee is calculated based on the assessed value of your land, and the use of your property. The Sewer Benefit assessment for a typical home owner for the 2008-2009 fiscal year was $300-$350. The Village of Whitney Point has a law that makes the property owner responsible for shoveling snow and ice from the sidewalks that are in front of their property. Snow and ice must be removed from the sidewalk within 48 hours after an accumulation of either has occurred. Should the property owners fail or neglect to remove the snow and ice within the 48 hour period, the Village Department of Public Works may clear the sidewalk. The property owners will then be charged a fee of $60. Should the property owners fail to pay the fee, the $60 charge is then added to their village tax levy. The purpose for this law is to ensure the safety of pedestrian traffic during the winter months. If you are planning to be away for an extended period of time, please make arrangements to have your sidewalk plowed or shoveled to avoid violating the law. Taxes are due June 1st through July 1st with no penalty. After July 1st, a 5% penalty is added for the first month, and a 1% penalty added for each additional month. After November 1st, any unpaid taxes are TURNED OVER TO BROOME COUNTY. View the .pdf file here that outlines the strategic plan for downtown Whitney Point. The Village of Whitney Point has a law which prohibits PARKING OF ALL VEHICLES on any public highway within the corporate limits of the Village between the hours of 2:00 a.m. and 6:00 a.m. during the period beginning November 1st and ending May 1st (for a 6 month period) to allow for the plowing of the streets. The Village contracts with an independent hauler for its garbage collection. Bert Adams Disposal currently holds the contract. The garbage is collected on Tuesdays, except when Tuesday is a holiday, in which case garbage will be collected on Wednesday. Bert Adams Disposal also handles the recycling program for the village. Yellow recycling bins are provided by the village, and can be requested at the village office. The Village also provides a "bulk refuse" collection service. This service is provided on the first Wednesday of each month, and the first and third Wednesdays of May and October. Items which might be included in this collection are: discarded household furniture, bedding, large appliances, and other household material too large to place in standard garbage containers. Yard waste is also collected at these times. Branches and tree limbs are not to exceed 6 feet in length or 60 pounds in weight, and should be bundled and tied. Leaves and other loose materials should be bagged. Old tires may also be disposed of during the "bulk refuse" pick up. A $2.50 per tire fee is charged. The Village is not responsible for the disposal of construction or remodeling debris. Property owners must make arrangements with their contractor, or contract with an independent hauler for this service. Such debris should not be included with household garbage, or with "bulk refuse" items; and will not be picked up. According to our local law, all garbage is to be put into garbage cans or sturdy, waterproof, plastic bags. These containers are to be placed at the curbside no earlier than the evening preceding the pick up, and are to be removed from the curbside no later than noon of the following day. Residents are responsible for cleaning up any scattered material caused by breakage or overflow of their containers. 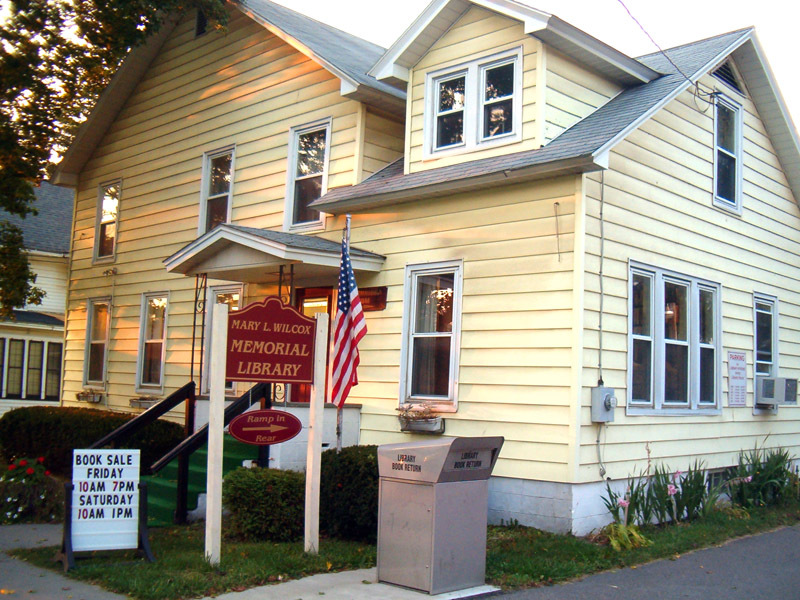 The Village runs a local library for the convenience of the residents. The library provides Internet access that is open to the public. The library is also part of the 4 County Library System which means that if they do not have a book you are looking for, they can borrow it from other libraries. The library is located at 2630 Main Street and can be reached at (607) 692-3159.